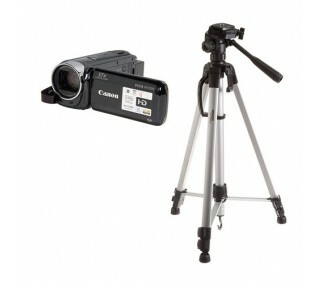 Packed with features and easy to use, this camcorder tripod package is the best all round choice for beginners! Lots of function in an easy to use small camcorder. Canon's HF R500 features an unbelievable 57x Advanced Zoom! Get up close from virtually anywhere and feel free to walk while shooting: the camcorder's SuperRange Optical Image Stabilizer will keep your video sharp and steady. Capture truly impressive, amazingly realistic 1920 x 1080 Full HD video with the Canon 3.28 Megapixel Full HD CMOS Image Sensor. Video is recorded directly to a convenient, removable SD memory card and is easily transferred to your computer via USB connection. The package includes 32 GB of memory card storage which holds 2.5 hours of the highest resolution video or as much as 12 hours on LP recording mode. Not only is this camcorder easy to control with its 3.0-inch capacitive touch panel LCD and fast, intuitive interface, but it also incorporates lots of ways to make your video polished, creative and of the highest quality. Intelligent IS optimizes image stabilization for the given conditions, while Smart AUTO chooses the best camcorder settings based on 38 predefined shooting situations. You'll record outstanding audio even under difficult conditions with Audio Scene Select, and give your video a unique creative spin with seven beautiful Cinema-Look Filter effects that can be added during or after shooting. Avista has also included a tripod in this package.